If you ask most people to name 5 Transformers “the white Porsche one” will usually follow Optimus Prime, Megatron and Starscream. Yet here we are an there is still no sign and of an official Masterpiece Jazz from Takara, and even third parties had shown an unusual reluctance to touch him. Now that reluctance has worn off and Generation Toy have stepped up and taken the first shot at Jazz with the brazenly named “J4ZZ”. A Masterpiece style Jazz in design, but with a modern aesthetic that is sure to divide people. Generation Toy is not a company I am familiar with, having skipped their Constructicons and Stunticons as I’m not a fan of their particular aesthetic, but thanks to TFS Express, I got the chance to put a review sample of Generation Toy’s J4ZZ through it’s paces. The main question I find myself asking is: do I refer to him as J4zz, J4ZZ or even Jazz…. Generation Toy have opted to sidestep the standard Masterpiece blue print of G1 accuracy and have rolled out, on luxurious rubber tyres, something more appropriate to 2016. 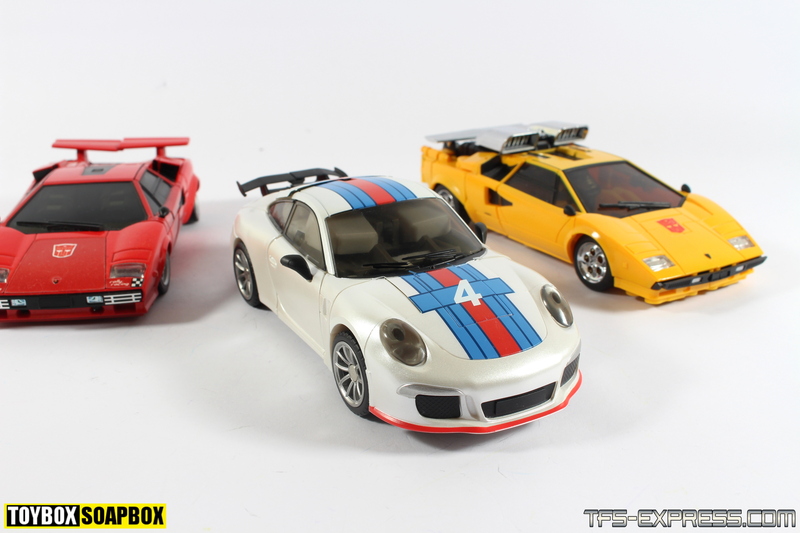 Replacing his iconic Porsche 935 Turbo, Generation Toy have opted to go with what I think is the 2014 Martini Porsche 911 Carrera. I am not a car guy, but I am good at Google and my eyes can recognise the bang on similarities of the body shape, the front grill, that distinctive front skirt and the spoiler. Even the wheels have ten spokes just like the actual car – so I’m confident that’s correct. Come on dudes – correct me! A lot of people will say it’s based on IDW, but IDW has become the default description of any time the classic characters are given current designs. Jazz was given a modern Porsche alt mode by IDW, and Generation Toy have been taking inspiration from IDW for their Stunticons (I loathe those Don Fig IDW designs), so perhaps they are right. For me this simply seems to be an attempt to give Jazz a 2016 update without being based on a specific iteration of the character. *edit* As Ambitron over on TFW has pointed out, the robot mode was based on art from IDW, but the designers chose to give it a different Porsche alt mode. Don’t ever let anyone say I am afraid to admit I am wrong! This wouldn’t be Jazz without the signature Martini livery and thankfully it remains in place, gliding sweetly over the roof and across the hood of the car. Aside from the red trim that wraps around the bumper the only other specific detail that comes from the original is the signature number 4 that is placed on top of an oddly elongated box. On the original car, G1 toy, etc etc this box sits within the striping, with the number sitting entirely within it, never overlapping, but here it’s elongated and I *think* the intention is to echo the rectangle which sits at the centre of the Martini logo and is positioned in the precise same place on the 2014 Martini Porsche. This seems a particularly clumsy way to homage two different details without hitting the mark on either. Without the red Martini circle and being in blue it doesn’t make sense, and being stretched with the number not sitting inside it, neither does it work as that particular detail. To further confound things, the number is angled and lacks the interior border it should have. I am all for so much of what this toy does to update things, but this is weird choice even drunk me doesn’t get. Let me stress though, that the toy is no worse off for it nor do I dislike it, it’s just a very strange combination and I am not sure why they opted for it. If it sounds like I am being fussy it’s because I am. Jazz is one of the most iconic Transformers and a huge part of what makes him so memorable is that racing garb, so it needs to be on point. Even though this is not G1 Jazz, it still has to be consistent but this feels like a tiny misstep where being on point would have yielded a more spectacular result. Here it feels like a battle was waged to try and find the balance between the modern livery and vintage detailing but it was never resolved cleanly. Also missing from the actual car is the striping that runs along the bottom of each side, but to be fair the red trim on the bumper is not on the 2014 car, so we are a sidestep away from the actual real world race car anyway. .
Have I gone full nerd? I’m sure I said earlier I’m not a car person, so how in an hour have I become a leading authority on Porsche 911 wheel trims? In a further distinction from the real car, Generation Toy have coated J4ZZ with a glitzy pearlescent sheen. Of all the changes this is the most contentious and will make or break the toy for many a collector. Giving off a subtle champagne gold quality when the light hits it, at first it seems very un-Jazz like as, bar when run through the Bay-filter of broken dreams, Jazz is always portrayed as being a very bright white. His colour scheme is such a signature part of Jazz’s look, how could changing that ever work? Surprisingly well, as it turns out. Taken as a the modern interpretation of the character it is, a glossy paint job befits this choice of alt mode and Jazz’s personality. Porsche’s 911 range does have a knack for coming with a pearlescent sheen (so Google tells me) so it’s not a wild departure. Choosing to make this separation from the original character also adds to the idea of this toy being future proofed from any forthcoming Masterpiece G1 accurate Jazz toys. In a fandom where we often automatically replace figures with the newer versions, no matter how similar they are, having a figure that stands on it’s own and appeals to a different taste is a good idea. This figure avoids the dreaded “but what if Takara do one” conundrum so many of us are perennially tortured by. The back of the car gets painted tail lights and some vents but is otherwise bland. A space for a number plate is sculpted in and left blank, which should keep Reprolabels busy coming up with puns. In terms of features, rubber tyres let Generation Toy J4ZZ roll smoothly and add a layer of luxury that you don’t even get from Takara anymore. What’s nice is that to facilitate the smooth rolling action (put that on the box GT) the car cleans up nicely underneath. Not like he’s had a whip round with some soap and a flannel, but all his parts fold up neatly and out of the way – there’s no dangling robot bits here. It’s another nice touch that keeps it feeling masterpiecy. A slot on the top is intended to wield the gun or that’s what I assume as this review sample didn’t come with a weapon. The Masterpiece cars generally do this so getting out my calculator and tapping in the math brings up….80085. Heh, remember when we all used to do that at school on our Casio calculators? Kids these days and their pesky Pokemon Go. *(I’m level 22 and have 101 Pokemon in my Pokedex – caught a Snorlax yesterday bwoy). Porsche’s 2014 911 is a stunningly beautiful car and it’s fantastic to see it used to house a certain bombastic Autobot. It might not be G1 but then it doesn’t always have to be and in this case it works astonishingly well. Sometimes it’s nice to have a change of pace and recapture that Binaltech/Alternator vibe of modern scale cars that can transform into giant robots. Generation Toy’s J4ZZ may not have all the bells and whistles that BT/Alts did, yet you with his rubber tyres, opening doors and modern, highly detailed, beautiful car mode it feels like an echo of that. It’s the sort of car I’d imagine Ric Flair drives, with the Four Horsemen theme blaring through the stereo. Though we all know Flair is more of a limousine riding,son of a gun. J4ZZ’s transformation is very familiar if you have ever transformed any masterpiece toy from Takara. Generation Toy have ensured it’s in step with the Lamborghinis and Datsuns particularly and it feels new but like you have been here before. The arms fold out from under the chest in a manner reminiscent of the Datsun Bros, and the stomach flap comes together and pegs into the chest in a manner that’s virtually the same yet 100% less scary. Generation Toy have given J4ZZ panels that flip up to fill out his abs which is an easy thing to miss. Take it from someone who almost missed it first time round. Particular features I identify with Masterpiece are the process of creating the legs by rotating either side of the vehicles rear, and the shin panels flipping out to fill in the cavities that would have otherwise been visible. Even his feet come with a little dab of magic as they rotate and then a tiny piece on the sole flips out to fill in the side purely for aesthetics. I appreciate that kind of thoughtfulness on my expensive toys. Once transformed J4ZZ’s robot form is every bit as great as the car mode. In spite of not being based on any particular model it’s still instantly familiar as Jazz with his classic silhouette having the slightest bit of that puffy Dreamwaveness to it. Jazz’s most memorable visual cue in bot mode, like many of the 1984 Autobots, was always his car hood chest. It’s the same here and the more rounded shape from the 2014 911 lends itself particularly well to the more rounded and chunky proportions. Sunbow’s original cartoon influence isn’t keenly felt in the details, but it is still evident in the proportions and body shape with long legs and the torso stretching upwards tp making him appear tall as that wide chest pushes outwards to broad shoulders. Much of his G1 robot mode detail has made the journey intact but is subtly updated in a manner reminiscent of the way Takara dealt with the first few Masterpieces after the reboot that MP 10 heralded. For instance his shins homage the vintage toy but in a manner that is in keeping with the original without being slavish. The clear blue plastic squares below the knees allude to corresponding stickers from the G1 toy’s shins, and if you look closely there is tech detail hidden beneath it. Simple piston detailing is added to the things in a way that calls back to the detailing Takara added to the thighs of the Masterpiece Datsuns. It’s a trend that runs through the whole figure, everything is a tightly focused homage to the vintage toy but with enough creativity to annoy those who believe Masterpiece means cartoon accuracy. I approve of this with every fibre of my broken being. We may be studying a very familiar looking Jazz but the colours have moved in a different direction. Obviously you have pearlescent paint we’ve already talked about, but an even more intriguing swtich sees the conventional white forearms and thighs switched to a metallic silver. Why they’ve done this but cast the feet as the sole white pieces doesn’t quite make sense to me but I can roll with it. Jazz always had a fat face and Generation Toy have perfected that biscuits in the cheeks look. Adding a pointy chin and having what look like a silver chin strap encasing his face does him no favours though. The sad thing is it feels like there is the perfect Jazz face hiding just beneath it. Having the the chin strap painted in the same colour as the face makes it look like the cheeks sit in front of the face which is a little jarring and not what I imagine they were aiming for. As far as head sculpts go this is actually pretty good and the light piping gives off a pleasingly dark glow. Using dark blue clear plastic is a bold choice in an age where most light piping is designed to be as bright as possible, but the darker blue feels more appropriate. Please world, can we get rid of these pointy chins though? Where did they come from? Why does everyone think robots need them? STOP IT. Most of J4ZZ’s car parts fold away somewhere to present a very clean robot mode. The rear windows tuck into the back of his legs, but don’t seem to lock into place and part of them folds out to give clearance to the heal spurs. If I was going to identify one place on this toy to be careful with I’d point to those. You don’t need to handle them with kid gloves, they aren’t fragile but they do jut out behind the toy and it’s easy to forget they are there when handling it or sticking it on a crowded shelf. Like all good car bots GT J4ZZ has door wings poking out from behind his shoulders to further widen his frame. There is no way to fold them away, so if you are looking for a way to make them disappear like the cartoon – you are bang out of luck. Weirdly, to say so much of this toy plays on the idea that is a modern Jazz for modern times the door wings don’t pivot upwards. Masterpiece Prowl, Smokescreen and Bluestreak all had this feature and it feels fairly standard at this point so it’s surprising it doesn’t show up here. It’s another little opportunity missed to make the toy perfect. Perhaps there is a reason for it though. Maybe the designers realised that by the time you got to the doors, you’d be too exhausted from trying to sort out the fiddly shoulders and the equally fiddly wheels to care about positioning doors slightly upwards. Generation Toys boffins added a hinge at the shoulder which allows it to move up, but it doesn’t click into place – friction keeps it in place. Stranger than Friction. Ha, totally forced pun. In isolation that joint is not a problem but it is when moving the shoulder becomes a 5 step process. You don’t just have that joint to contend with, there’s the shoulder itself, the wheel well and then the multi jointed wheels. Constantly, I found myself readjusting things and then just when I thought I had it sorted, I’d nip outside to chase a cat off of my lawn, and then return to notice one of the arms sitting slightly higher than the other. People with OCD will feel like they are being trolled. Thiss is a really minor complaint and not even really a complaint as you gain a couple of extra degrees of articulation, but I do wish that one hinge clipped in securely rather than being allowed to move freely. Articulation is another tick in the win column for Generation Toy with J4ZZ. Ball joint head, aforementioned fiddly multi hinge shoulders, double jointed elbows, wrist swivels, waist swivels, waist flaps, swivels below the knees and feet that swivel in every direction – there’s a lot of things to move if you like moving things. J4ZZ is a very light figure, in line with the current Masterpiece trend, owing to a lack of die cast metal. Some folks may not like that as die cast is often seen by some as a symbol of quality, but what it does mean is J4ZZ is phenomenally well balanced. His ankle joints provide a bonus bit of stability by sitting on the ground to widen the foot base. You can do what you like with him pose wise. Walking poses, high kicks, The Maz Run and just about anything else your heart desires. But lets be honest with ourselves, we all know he’s mainly going to stand up straight on our shelves – which seems like a bit of waste. I mentioned earlier that this sample did not come with a gun, so he is left to arm himself with two shoulder cannons. Controversial to many as they come out of left field and don’t appear to reference anything in particular, but I like them as the clear blue plastic reminds me of that tiny screwdriver that came with IGear’s Kup head. G1 Jazz’s toy had a single shoulder rocket launcher but it wasn’t anything like these and didn’t mount in the same places so it’s curious as to where the idea came from? Integrated weapons are a fan favourite so I suspect the designers were just being creative and wanting to include to some inbuilt weaponry. It may not be especially successful but I can applaud the effort. If you aren’t a fan, fear not as they are very easy to remove via a simple screw. However, a note of caution, the wheels clip into the small peg on the screwed piece in car mode. It’s not a secure fit so you can get a way without them, but just be warned that it’s what they are intended to do. Each cannon is on a ball jointed arm so you could in theory pop them off and go about your business. I say in theory because it’s a pretty tight ball joint on this sample and I don’t want to risk breaking them. You can be lazy, like me, and if you don’t want to see them then just tuck them behind the arms where you can’t see them. It’s the easy peasy, lazy Liam solution. J4ZZ’s hip flaps do contain magnets which allow the gun to stick them as a kind of holster. Or Starcom figures. Starcom figures are better. So, that was our very first third party crack at a Masterpiece Jazz. For a lot of people this is going to be an easy pass as it’s not G1 enough, which is a big shame because it does feel special. From the finish of the toy, to the transformation that echoes the Masterpiece Autobot cars, something about this toy feels like a stand out moment amongst the non stop churn of third party releases. I think it may actually be my favourite third party figure ever, it’s like the toy I hoped Sunsurge would be. Perhaps the greatest compliment I can pay it is that if it had an Autobot badge applied and you told me it was an official Takara Masterpiece – I wouldnt doubt you. Unecumbered with trying to adhere to a 30 year old animation model, Generation Toy have created something special that is not without it’s faults but makes a nice change of pace from every company trying to beat Takara to the punch with the most cartoon accurate figures. More of this sort of thing please. Definitely going to get J4ZZ. The 4 and the martini zero are so minor to me, it's not possible to care any less. I love that we are finally getting a Porsche Jazz, but unfortunate that it is no official. (which, honestly, will probably never happen) For all the things he does right, I think he is a win all around. Great review! Can't wait to get mine! I am still hopeful of an official Takara Jazz. Lately they have made an art form of releasing Masterpieces we never thought would happen, so I wouldn't discount a Masterpiece Jazz. Those details are all minor quibbles and not anything that bothers me either, it is just something I noticed after spending a fair amount of time pouring over G1 Jazz and photo's of the actual car this toy is based off, so thought it was worth mentioning. In no way does it bring down the figure, it just strikes me as a very unusual choice to try and merge two details and not really serving either particularly well. I adore this figure – I really do. If you enjoy my content then please consider supporting what I do. Thank you.